Music is usually played throughout a wedding ceremony. The bridal couple meets with the music director or wedding planner to select music for each stage of the wedding ceremony. Music is an integral part of wedding ceremonies, both religious and secular. At the very least, music is used for the processional, or march, and recessional. Most ceremonies include music in a few other capacities, too. Many wedding ceremonies play music while guests are being seated. Typically, this begins approximately 10 to 15 minutes before the ceremony begins. The music is generally much quieter than music played during the actual ceremony. Song selections may include classical pieces like Moonlight Sonata or religious choices like Jesu, Joy of Man's Desiring. Typically, the selection of the seating music is left up to the musical director or organist. However, couples may want to request a particular song for the seating of the parents or grandparents. Ask your parents if they have a song with special meaning or choose a song with classical or religious significance, like Borning Cry or You Raise Me Up. When the bride makes her entrance, the same song may be played as before, only with more fanfare. However, most brides prefer to choose a special song. Wagner's popular Bridal Chorus is not the only choice. 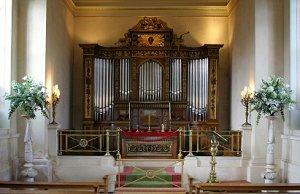 Consider walking in to Trumpet Voluntary, At Last or even the processional music from the movie The Sound of Music. Special music during the ceremony is often played during the lighting of a unity candle. Sometimes solos or duets are sung, or instrumental choices are played after readings and prayers. Every religious denomination has preferred songs to use during the ceremony. A few Christian wedding song choices include Ave Maria, Amazing Grace and The Lord's Prayer. Contemporary songs are also included as special selections. If you're having a religious service and want to include secular songs, check with your officiate first. Options include Unchained Melody, Can't Help Falling in Love and Friends. Love songs for weddings are popular choices for couples who have a solo or duet planned. Once the entire bridal party has exited the ceremony, music selections similar to those played during the seating should be played until everyone has been ushered out. Tempo: Is the song too upbeat for a religious ceremony? If people are marching down the aisle, will the tempo force them to walk faster? Length: Songs that are too long can cause awkward pauses during the ceremony. Consider playing an edited version of a tune for certain elements, such as lighting the unity candle. Source: The source of the music is just as important as the music itself. Decide if you want to use an organ, piano, pre-recorded music or even a four-string quartet. Every option results in a unique interpretation of your chosen music. Factor these considerations into making your final selection and you are sure to have the perfect wedding ceremony music for your nuptials. The most important consideration is to choose music that not only means something to you but is also appropriate to the occasion. After all, you'll have the memories for the rest of your life.